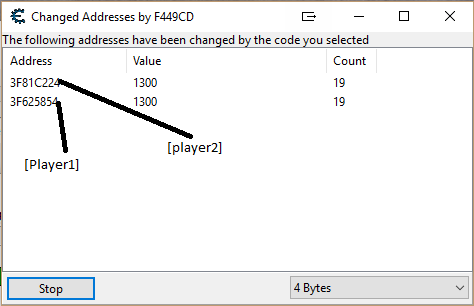 I want to get multiple player ID from a code, which only access our team member's addresses, not the enemy's. So it is very important for making godmode for both our player and companion player. I have write code in asm but when i activate the script, game hangs. I think game goes in infinite loop when i activate the script. Can anybody please correct my script. Or if someone have lua code which works like this , please share template of it, so i copy paste it in my script, because i have not knowledge of lua. // if [ecx+000001D0] holds a pointer, then the above instruction is valid. // question goes here: what does [ecx+000001D0] holds? and is related to what? jmp newmem // if previous condition failed, then it will loop again. // you are not doing anything special, no godmode no infinite health ... only eax is being moved into player2 memory location. // and then original code gets executed normally, and it will affect both player 1&2. if that instruction operand is a memory location that holds a pointer, then you can use MOV to get whatever in there. which only access our team member's addresses, not the enemy's. if the instruction only accesses the player and player's team, then why would you need a compare? This code is only access our team's health so this is the good location to fetch player ids. This is not the code that write to our health so there is not need to write any god mode related code here. This code is just for fetching player IDs. When we are click on "find out what addresses this instruction accesses" i found two addresses of team member's health. So i want to assign one address to [player1] and second address to [player2]. My script is only accessing first health address then going to infinite loop because it is not accessing the second health address to get out from the loop. So is there any other code there to access the second health address, specially Dark Byte knows if he have made some provisions for this. Thanks it works and great logic to access both the addresses.